This week I showed 6th graders three video book trailers to introduce them to some new books in our Library. Our students are from a visual/video generation and as a way to interest them in the “old fashioned world” of the printed page we are lucky to have many book trailers available online. 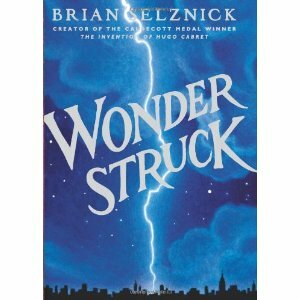 The first one I showed them was an interview with Brian Selznick, author of Wonderstruck. Following in the style of his other huge bestseller The Invention of Hugo Cabret, this book alternates between a visual and print story. It was great for students to see him explain his passion for his books and they were very intrigued by the story line in Wonderstuck. Instead of a trailer about the book, our second video was about the author of OK for Now. It’s a great video of Gary Schmidt, a rather quirky author (he uses a typewriter!!! ), and it got students very interested in the book. The third trailer, A Mango Shaped Space by Wendy Mass, focused on the narrative about a girl with an amazing ability to see things with all her senses. Needless to say, all three books were quickly checked out. In fact we had to flip a coin to see who would get the book first! Finding book trailers is easy. You can google the title of the book with the words “book trailer” and you will usually get several results. It’s good to look through them first. Some are more professionally done than others but even the ones done by other students can be worth the look. Also in the Library this week…..
Second Grade–We did it! We voted after hearing our last California Young Reader Medal Nominee. Stay tuned for results. Third Grade–Third graders in Mrs. Fargas’ class heard CYRM nominee On Meadowview Street. Next week they will vote. Fifth Grade-This week we began our series of lessons on Website Evaluation. To start things off I showed them and excellent video on BrainPOP called “Online Sources.” After viewing the video we talked about the importance of the 6 criteria explained. Next week fifth graders will be at CIMI camp so the following week we will evalute some websites together.